You’ve probably seen more than a few Web directory lists floating around the Web. There are free Web directory lists, paid Web directory lists, and even regional ones. Maybe you’ve used one of these lists yourself — you found a list of Web directories on a forum or blog and you used it as a guide. You submitted your site to some or all of those sites included. Are Web directory lists really a good thing though? Sure, they can be used in Web promotion. But they can (and often do) result in spam. That doesn’t just include the people who were spammers going in. Web directory lists can inadvertently turn well-intentioned webmasters into spammers too. Let’s take a look at both the positive and negative sides of Web directory lists, so you can decide if they’re a worthwhile tool to either create for your own website or use in your marketing plan. A Web directory list can save you time because you don’t have to manually search for the Web directories you want to submit your site to. Web directory lists might tell you the PageRank of each directory to help you prioritize them (if you still care about PageRank when it comes to linkbuilding — personally I don’t, but I know some readers do). You might be able to find well-targeted lists that help you sort through the noise on the Web — like a UK Web directory list if you’re based in the UK and want more regional links and exposure. There are so many Web directory lists available online, that it might take you just as long to find a good one as it would take you to use a search engine to pull up targeted directories on your own. Many Web directory lists are outdated. That means you’ll have to sort through listings for directories that no longer exist, have moved, or are being neglected by their owners. Submitting your site to a huge number of general directories isn’t usually an effective way to spend your promotional time. It’s better to work in high quality directories that offer a real chance for targeted traffic and quality links, and then combine submissions with other marketing tactics for a well-rounded approach. Web directory lists might encourage you to spend too much time on submissions, which could actually negatively impact your ROI (return on investment — and remember it’s not just about money, as every minute you put in is an investment). A well-crafted, up-to-date Web directory list can be used as one component of an effective Internet marketing campaign. But that doesn’t mean it’s the best tool. It all comes down to the individual list you’re using, and how you plan to use it. 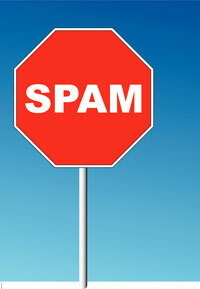 Promotional tools or not, Web directory lists are also often guilty of encouraging spam. As a former Web directory owner I’ve been a victim of this type of spam, and I’ll share that story with you below. 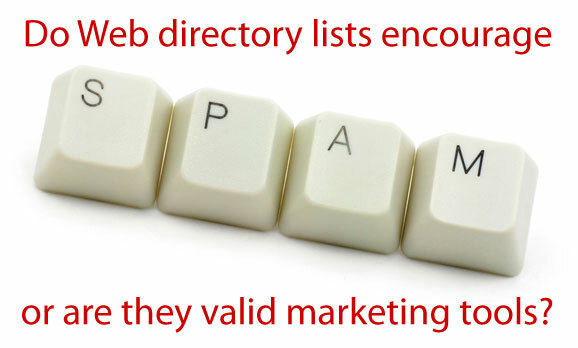 But first, let’s take a quick look at some examples of ways Web directory lists can directly or indirectly lead to spam. Users manually spam every site on the Web directory list, regardless of whether or not their site meets all of the requirements. This can happen because they’re so worried about submitting to all of the sites for links, that they quickly skip to submission forms (which the directory list might point them to) without reviewing all of the terms of the site. People might add all of the directories from a Web directory list into an automated submission tool which they either use themselves or distribute to other site owners to spam directories. The Web directory lists themselves are often copy / pasted and spammed from one forum, blog, or other community to the next when others are too lazy to assemble their own up-to-date list. I want to share a story focused around that second spamming method with automated submission tools. In the past I ran a free Web directory (two actually). The one in question was the first of its kind. We only accepted deep links, and only a very specific kind of deep link. People started linking to the directory, especially on forums. It was picked up by some of the submission tools’ creators from those lists. They added it to automated submission software targeting mostly general Web directories (meaning people were submitting homepage links — something we didn’t allow). We got thousands of spam submissions from these tools (and that’s being rather conservative). It got so bad that I eventually quit the site to pursue other Web development projects, let it sit idle for a long time, and eventually sold the domain. Sometimes spam can become unbearable. Because these Web directory lists will often link to any and all directories they can find (without knowing or mentioning their submission requirements), they allow spammers to wreak havoc on directory owners. They also potentially put that “spammer” label on their users — the people submitting their sites. Web Directory Lists: Friend or Foe of the Well-meaning Webmaster? What are your personal thoughts on Web directory lists? Do you use them effectively? Do you allow them to become a time drain? Have you ever spammed anyone as a result of a certain Web directory list? Have you even considered the negative image using these lists could lead to for your site? Share your thoughts about Web directory lists, linkbuilding with directory submissions, or directory spam in the comments below. I think that while some lists are created specifically for spammers (like a few that my blog has ended up in on black hat SEO forums), many lists will bring a directory more good submissions that should outweigh the bad ones. That's how I look at my comments at least – I am on many lists that are getting noticed by spammers and driving spam comments to my site, but I also get a lot more genuine comments thanks to being on these lists. Not to mention a little boost in backlinks. So all in all, I like to think the pros outweigh the cons in this case. I have been using specific directories for many years, and have a set of criteria I use before I submit websites to them. Spammers, like junk mail, are a hazard of a modern society. Many lists are no longer useful because the links are dead or the directories are gone. I definitely think that some directories are basically meant for spammers, while others are a useful resource. However, I doubt that many actual customers are using directories. I’m wondering if that will ever change – I wish it would. With all the competition in the regular search results, it would be very refreshing to use a well-constructed human-edited directory to find what you want (and not all the extra crap). When I search for ‘shower stalls’ for example (I need a new bathroom), I get a lot of results I don’t want – even when I just specify ‘more shopping sites’. I think that well-built niche directories with blog/article support and/or tools specific to the niche would be a ‘wanted’ destination for a surfer if only they could find them. Maybe Google should consider including that as a category instead of ‘shopping sites’ but I guess that kind of thing would be competition for them so I suppose they won’t. Like everything on the net, you've got to keep reviewing. Some directories are great, so we use them. Some are havens for Spammers, so we don't. But we never stop monitoring to make sure the former haven't become the latter. I agree with Kristi, there are more pros than cons. I have my own list of directories and usually submit there. One thing more u could not stop spammers from targeting these directories. Such thing will go on. Some solution is required to fight with these spammers and closing the directory like u did, is no option. Still there are so many directories which are very useful and they have maintained the standard over the years. This is an interesting article. Like most things on the web, you've got to keep reviewing and do not use automated submission tools. We have a done a lot of research on the directories that we use and only use a handful of them. If they don't allow us a specific category for our interest then we won't use it. The other thing we don't recommend is any automated software to submit. You will definitely end up in categories and pages that are nowhere near relative to your subject and will do you more harm than good. Great post! There's no doubt that 99% of directories are spam crap. But there is value in niche targeted directories… we're talking the 1% that are authority within the industry and rank high in search engines. Almost all niches have such directories and they are very valuable. Webeserve is SEO and traffic generation crowdsourcing at its finest. Our FREE innovative web portal allows advertisers to outsource SEO and traffic-building projects to tons of skilled freelancers. Partner with freelancers all over the world who will each complete an individual part of your campaign instead of relying on one person to finish the entire project. We call this groundbreaking technology Pay-Per-Service you only pay for the services that are completed. There are no hidden fees or monthly charges. WebeServe is 100% risk free and costs nothing to use! We don’t use a lot of directories to submit our sites to unless they are reputable directories with a high PR and categories in which we fit well. We definitely avoid the directories that appear to be full of spam like listings. Thanks for the great post. I have seen most of the sites doing really well from spam traffic. Niche web directories are still a great way for getting some relevant links to your website. There are pros and cons to web directory lists, it depends on how one approaches it. There are pros and cons about web directories. If you are using this technique according to Google guidelines, i.e. doing web directory manually, don’t repeting your submission info, etc… then this technique still worknig in website optimization. 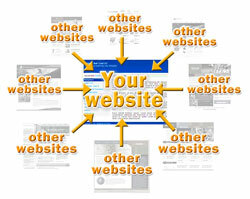 In addition to the said, submitting your website to free web directories is another excellent option. The problem is: the directories numbered hundreds of thousands and difficult to know who-is-who among them. I found this great site DirectoryGist.Com (http://www.directorygist.com) with List of Top Web/Article Directories, Social Bookmarking Sites & Search engines – where you can enlist your website or/and business Free of charge. Currently, there are about 6000 directories in the database, with weekly updates, google PR and Alexa traffic for each directory. This is one of the free and effective ways you can use to promote your business, especially for starters with more time to spend than money. Thanks Joseph. Out of curiosity, are you promoting the site because you own it or are you just a happy user? And if the latter, what would you say sets that site apart from the many other similar directory lists? The list comes with weekly updates, google PR and Alexa traffic for each directory and that sets it apart. You just have to visit the site to grasp what i’m talking about. Thanks for the additional feedback Joseph.